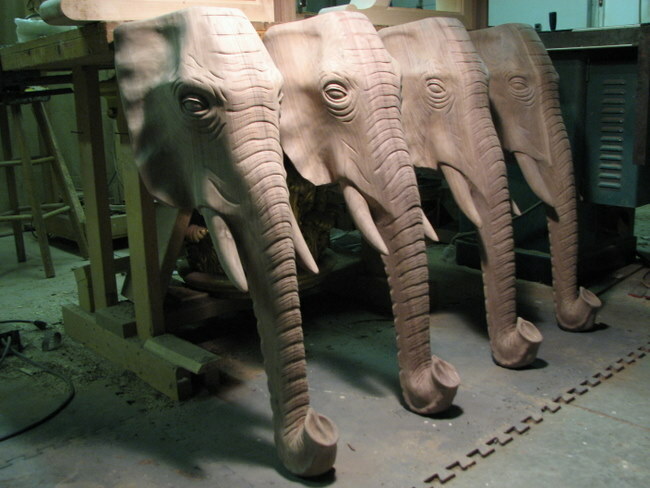 I’ve recently begun an interesting project where I was asked to design Elephant heads where they would be used as legs for an Island Unit. 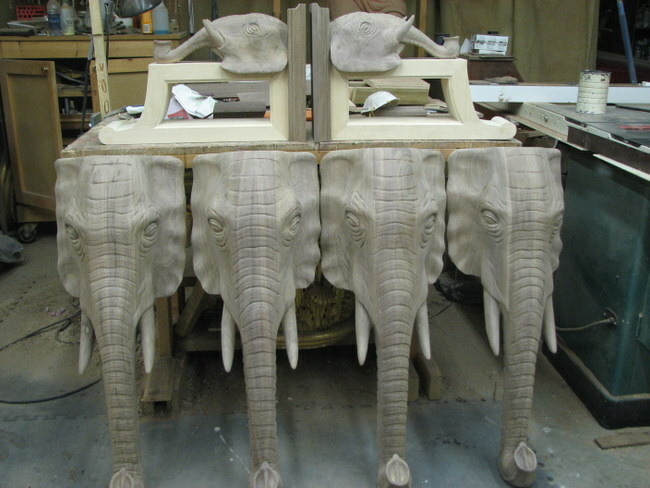 As you can see the trunk resembles a “typical” leg for a table. Two of these will also have a conduit running through them for electrical service to the Island unit. They will fit at a 45 degree angle to the corner of the unit. I also have to design two corbels or brackets to support the range hood. The hood measures 5 ft X 2 ft. and the brackets must fit into an area 8″ X 15″ X 20″D. I only made the Elephant head as the bracket will be fairly straight forward. Here I’m showing them in the clay mock up stage. The large piece has been approved and the smaller one is awaiting approval. 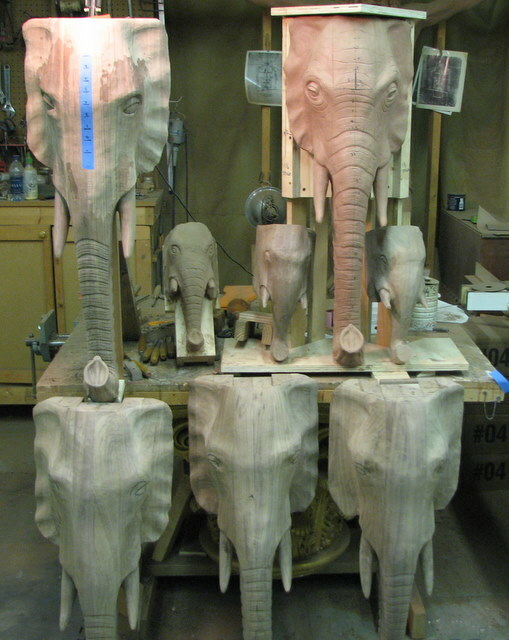 They will be done in Walnut and left in a natural finish to match the top of the Island unit which is also being made of Walnut.I wasn’t able , because of space restrictions, to do a complete and accurate depiction of an Elephant. The primary objective here is to get a representation of an Elephant within given parameters. The client was thrilled with my renditions so far. 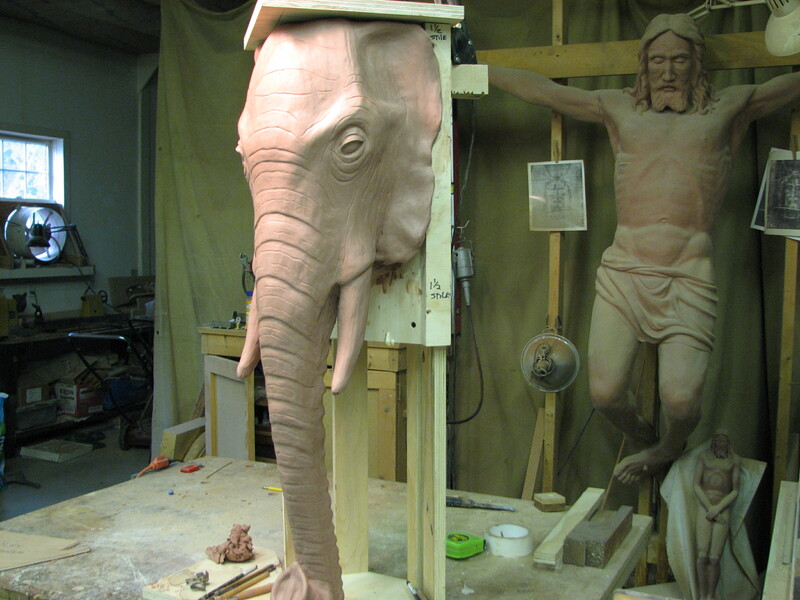 The large head is 34″ high, 10″ wide, and approx 10″ deep. The smaller is 14 ” high, 6″ deep and 6 ” wide. Should be an interesting project I believe. The square on the top represents the area covered by the counter top. As I indicated , the leg ( head) will be at a 45 degree angle to the unit. And this is the small head approx. 14 ” tall for the face of a bracket supporting the range hood. As I said, it didn’t have to be an anatomically accurate depiction,, just something that said “Elephant” a bit more convincingly than what is commonly available. It seems to work. I was able to glue up the blanks for the heads and get them roughed in as you can see in the following photos. In two of the heads I was able to run an electrical channel up the center of the trunk as power is needed in the island unit. 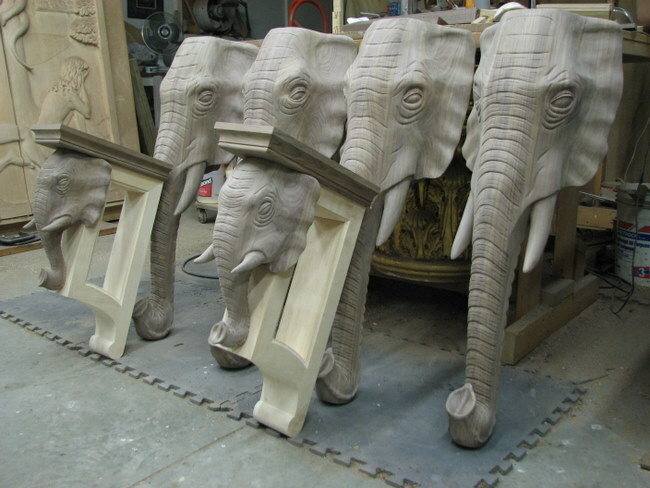 The tusks are carved as part of the whole block and are not inserted separately. I was able to do the bulk of this carving prior to gluing up the entire head. That made it much easier to reach areas as well as remove stock instead of fighting with a massive block of walnut. The model was so important to allow me to do this as it gave me all the reference points I needed to follow. Here is where I am at the moment. Finished pieces are not far away. A group shot, or is that a herd? The blue strip you see on one is an index. I use this one as the master to take measurements from. 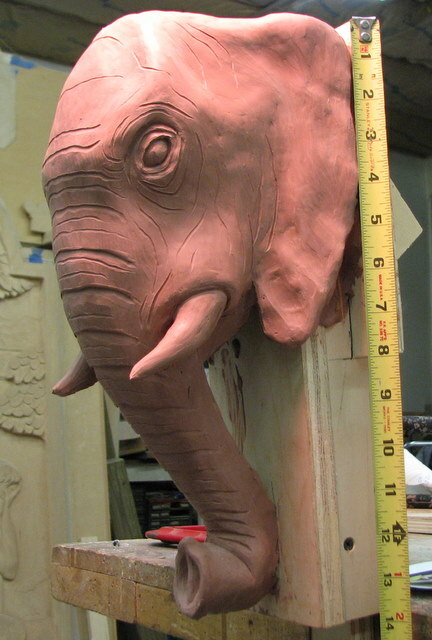 The clay was used to make this one, but repeated measurements and profile gauges start to distort the clay. So now I take all measurements from the wood one. Again, they’re only roughed in at this point but you can see how they are progressing. Well after a bit of time ( and effort) I managed to get them completed. The shots may not be the most flattering but you’ll be able to see how they came out. The smaller heads that are to be used for the Range Hood were added to some simple brackets I made out of Basswood. I used this wood only because of it’s less porous grain since just this part will be painted in an Ivory with glaze finish. The rest of the wood ( the walnut sections) will be done in a natural finish. 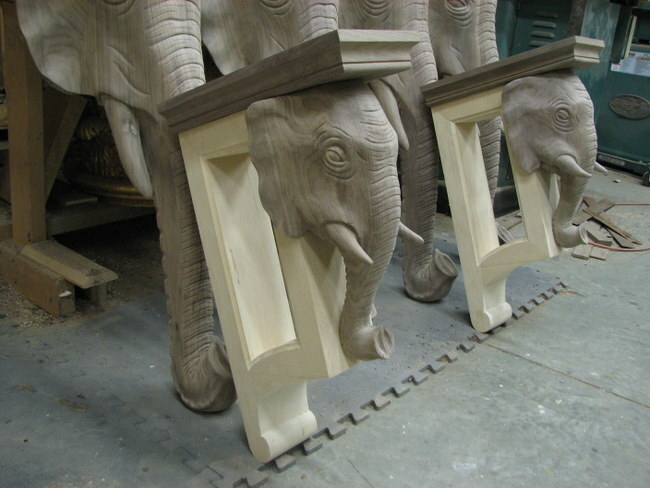 This should be a nice contrast allowing the carvings to stand out a bit. Well there they are, I hope you enjoyed following them along. Any questions or comments I’d enjoy hearing them. now that is a neat project ! 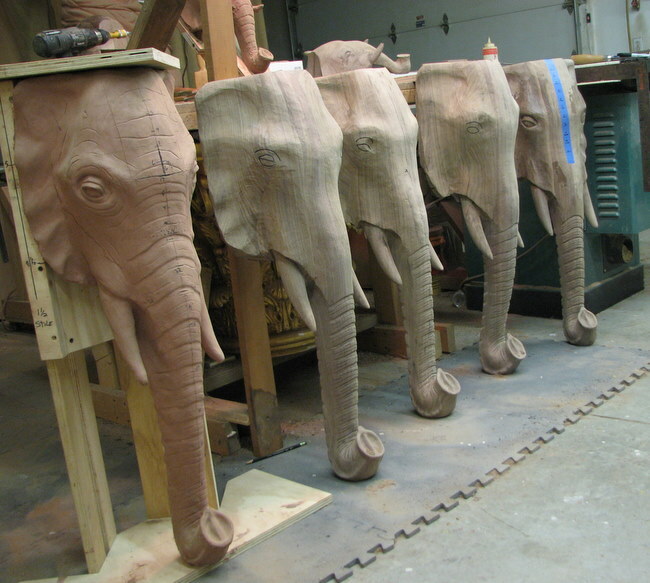 love the elephant heads, they have lots of character … one thing that pops and i want to turn your attention to, is the ends of the trunk (in both elefants, but more so in the smaller one). i was thinking the inside curve is not bending in a pleasing curve and the end of the trunk should be smaller in diameter to give more of the real thing. i know you said, the real is not required, but its a minor point which would enhance much in my opinion. may be you considered it, and there are stability restrictions, but i thought i mention it… anyway you have way to much fun…lol… they are great. i am looking forward to the carving ! Yes, I am aware of that. What I did was to use a variety of blocks to build up the general shape of the head to limit the amount of clay I would need. Then I cut a piece of plywood in the general shape of the trunk to support the clay in this area. Unfortunately the curve you see ( or don’t ) along the back of the trunk especially is the shape of this curved piece of plywood. I should have made the piece smaller, packed more clay around it which would have given me more room to play with the shape. As it is , it limited me to how much sculpting I could do. This serves as a 90 percent model.. the remaining 10 percent of the carving will get addressed in the wood as I anticipate shaping this area a bit more. At this point I didn’t want to dismantle the entire block with the clay already on it just to make the trunk curve a bit more. It’ll happen in the wood. My main goal here was to be able to show the client something more than just a pencil sketch and easily make changes to something they can actually look at from all angles. And it gives me a decent starting point for measurements as to glue up, basic shape etc. With only a pencil sketch of something like this, anything can be made to happen in the drawing ( Escher comes to mind) but can’t be done in an actual carving. 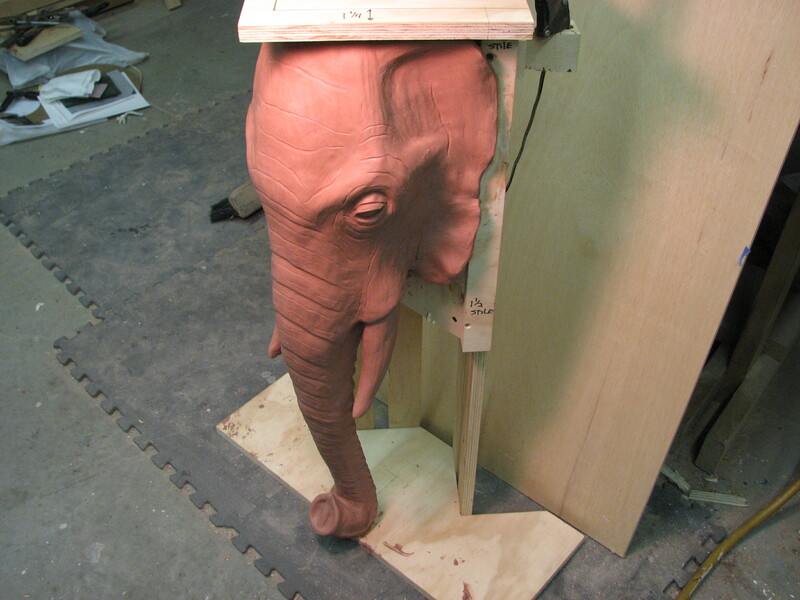 The end of the trunk on the smaller head was also something I considered. I debated between a smaller vs. larger end. Considering the mass of the head and the relative shortness of the trunk ( I could make the head smaller of course) I decided on having a bit more mass to the entire head and trunk. This one goes under a range hood and I don’t want it to get lost under there. Shadows and all other factors taken into consideration. The general viewing distance will be some distance away where the main seating is and I thought this would read a bit better seeing it essentially straight on. I also had to consider fire codes, This bracket has only a 6 inch space allowed for near the stove. Although the hood is quite massive in proportion ( almost 5 ft wide) I thought a relatively narrow 6 inch wide bracket may look a bit sparse sitting under there trying to look like it supports the hood. Hence the greater mass of this piece. Their original proposal of a bracket 6 inches deep X 10 inches long,,, under a hood 5 ft wide X 24 inches deep and almost 4 ft tall would have looked silly. This seems to help a bit. The legs on the other hand will be viewed basically from above,, or overhead. And here I had to consider that these will support the entire weight of the island unit, a thick Walnut top, drawers as well as a microwave unit. And too, a couple of them will have to have a hole through the middle of the trunk to allow wiring to be hidden and run up to the island unit. 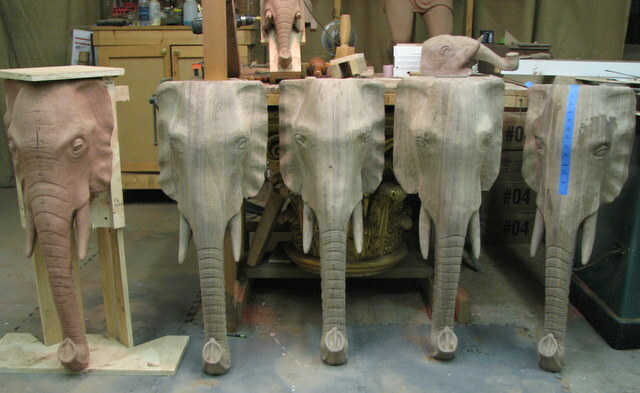 If these were just studies of Elephant heads you wouldn’t be looking at what I’m showing here. I wish I had another 6 inches of depth for the large heads in addition to a few more inches of width to make the ears properly. For the small heads I’d like another few inches to proportion the head better. But as it stands with many Architectural projects, compromises must be made in sacrificing accuracy or authenticity with what needs to be done with space limitations, codes, viewing angles etc. to find a balance between what will work, satisfying the client and having a decent representation of what is needed. hey mark, yes this makes perfectly sense… also, only now from your reply i understand what island unit is, the pieces goes into a kitchen ! …lol, i dont dare tell how i misunderstood “island unit” … foreign language is a tricky beast sometimes… thanks for enlightning me, it is always a pleasure to follow your path of though. Ha,, my path of thought. It’s like the flight path of a Butterfly. So many things to consider along the way that it seems fragmented. But I generally arrive at my destination. Yes, these go into a kitchen. We may at times use different words but we are all talking about the same things. Many of the expressions you have taught me have been so much better than some of the expressions we use in the States in describing an event or someone’s motivation. Island unit , as I’m sure you already knew, is just a table, or a collection of cabinets with a top, sitting in the middle of a kitchen. Thanks Doris, I always enjoy your input and views on a variety of topics. You make me rethink my decisions in a most helpful way. It’s been a while but I thought I’d just check in and, yup sure enough, your work still knocks me out! Your artistry never fails to impress. Still playing with wood and sharp things myself, now and again. Be of good health, my friend.